Blog Home > Competitions > DIY Doctor LoftZone Winner Announced! DIY Doctor LoftZone Winner Announced! We can now announce that the winner of the Storefloor system from LoftZone is Martin Wilkinson from Lythan St Annes, Congratulations to him! Martin is in the middle of an improvement project in his own home, and we are sure that the StoreFloor loft storage system will help him to store his suitcases (and later on those Christmas decorations!) while allowing him to improve insulation in his loft, if he hasn’t got around to that already. 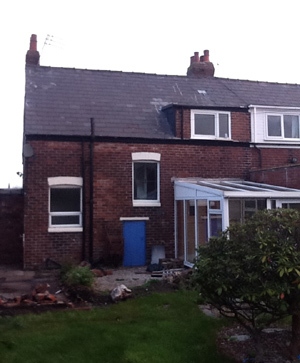 He sent us this photograph of his project which needs lots of work doing and includes a large extension on the back of the house, we are recommending to him that he tries out our Price Doctor software when he plans his extension, as it will help him to stay in control of his building costs by allowing him to make choices on materials and fittings before he organises the work. “LoftZone is a new company with a product that saves energy and improves people’s homes by opening up more space. And it’s made in the UK too, creating jobs in our economy”. Read more about how Storefloor works in our project section. You can see the DIY Doctor review video below. You may have already experienced StoreFloor ‘live’, because LoftZone provide the stage for the Northern Homebuilding and Renovating Show, in Harrogate, this year, and many of our audiences there entered the prize draw. It will be coming with us to the shows next year too. The next one will be at the Birmingham NEC in March. DIY Doctor is working with a number of suppliers who sponsor the site to bring you offers, and prizes and these are all going to be published on our new competition page in the New Year. We always publish any discounts and prizes in our Monthly newsletters so if you haven’t signed up already, why not do so now, head over to our homepage and fill in the form at the top of the page for the latest offers.